Over the weekend, it seemed to me that the sentiment in the valley seemed to change abruptly. Dan Primack wrote Fear and Sadness in Silicon Valley, and Danielle Morrill punctuated her post Somewhere Over the Brainbow: The Unicorn Window is Closing images of unicorn cannibalism. While the attitudes may be changing, the effects haven’t yet revealed themselves in the data. So, is the environment truly changing? 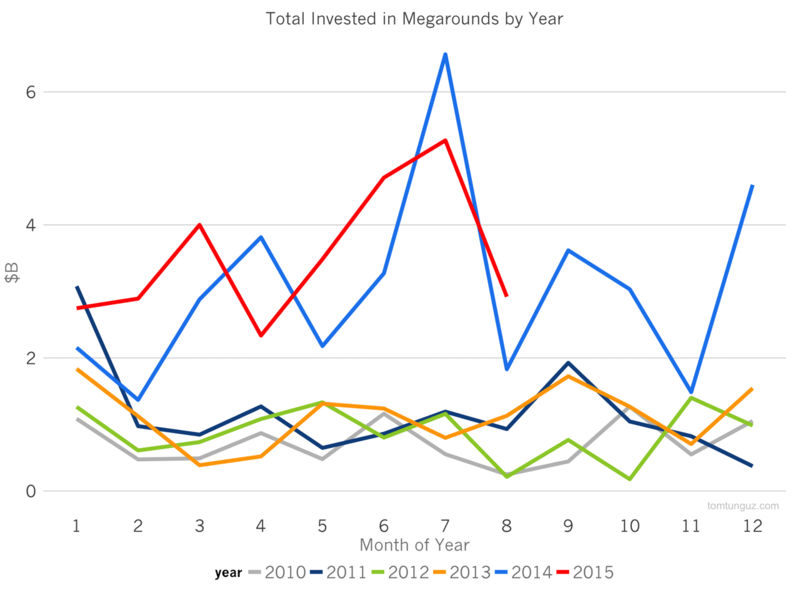 The number of megarounds, investments of greater than $40M in US companies, continues to surpass last year’s figures. 2015 demarcated in red in the chart above, notched more than 40 megarounds in July. 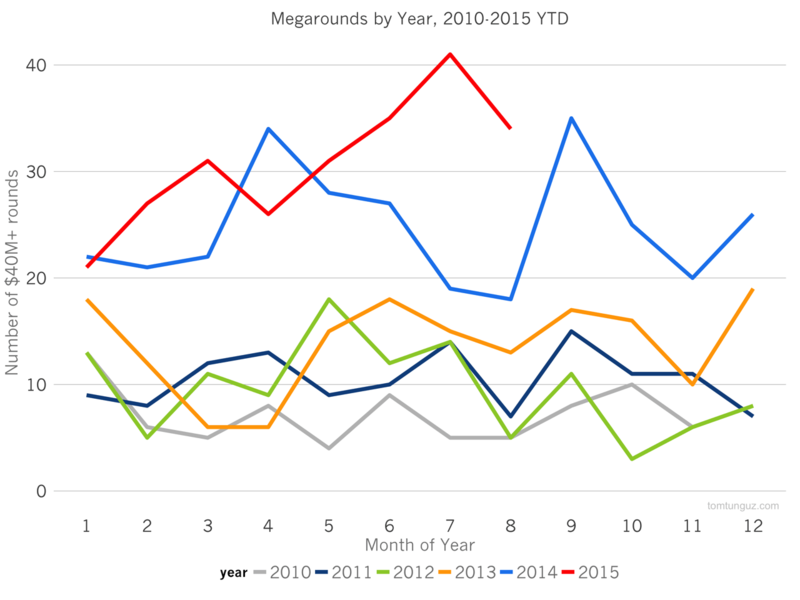 In fact, there was only one month in 2015 that saw fewer megarounds than 2014 - the month of April. In terms of aggregate dollars invested, 2015 is on pace to be another record-setting year. In this case, two months in 2015 are smaller than their counterparts in 2014. Most notably, investors invested $5.3B in July 2015 compared to $6.7B in July 2014. Part of this delta may be due to companies in 2015 delaying their fundraising announcement for strategic reasons. Or it may be an early harbinger of a slowing market. On the other hand August 2015 exceeded August 2014 by $1.1B. In aggregate, then, it’s close to a wash. If we examine the data through August of each year, in order to minimize the effect of delayed financings, we observe that 2015 is setting the high-water mark for number of rounds and dollars invested. We’re in an unusual time. The stock market is easily perturbed, while the private fundraising market booms, and has for more than five years. Startups are growing faster than ever before, but the mentions of layoffs at several high profile tech companies suggests some businesses’ economics may not be as favorable as once perceived, and has the potential to rattle an unwavering confidence in growth. Private market multiples are twice those in the public markets, yet startup IPO and M&A activity in 2015 has halved from 2014. With all these forces in tension, we will see many conflicting data points and opinions - and it can be easy to lose perspective in the maelstrom. The most important things to do as a founder now are the five essential tasks that must be completed no matter the environment: think long term, manage the company’s cash well by planning for the future, hire great people, mitigate customer churn by building great products, and raise capital opportunistically. And let the data sort itself out.